9. Queen Sofia of Spain presented trophies (including to a clearly impressed Rafa) at the Madrid Masters on Sunday, and she wore a rather sunny brooch for the event, along with her usual necklace and stack of bracelets. 8. Here's an item we overlooked last week: the Prince and Princess of Monaco welcomed the president of Montenegro to the principality on May 6, and Charlene continued her trend of slowly incorporating more jewel pieces into her wardrobe by donning a pair of classic pearls stud earrings. And we've got an even better jewel opportunity for her on the horizon: it's been announced that Albert and Charlene will visit the Netherlands during the first week of June. They'll be there to officially open an exhibit about the late Princess Grace, but the event will also include a dinner at Apeldoorn. Fingers crossed for tiaras! 7. Speaking of the Dutch royals, Queen Maxima wore a pair of glittering jewelry pieces at the King Willem I Awards on Tuesday: diamond pendant earrings and the ears of wheat aigrette that Queen Emma received as a wedding gift in 1879. 6. At the beginning of an official visit to Poland on Monday, Crown Princess Mary selected only a simple pair of sparkling stud earrings to pair with her outfit. But this was an occasion where elaborate jewels would really not have been appropriate, as the couple were visiting the Tomb of the Unknown Soldier in Warsaw. 5. More glamorous and splendid was the installation service for the Order of the Bath, held on Friday in the Henry VII Lady Chapel at Westminster Abbey. Along with her robes, Queen Elizabeth II wore two items that belonged to our Magpie of the Month: the Girls of Great Britain and Ireland Tiara and Queen Mary's Floret Earrings. 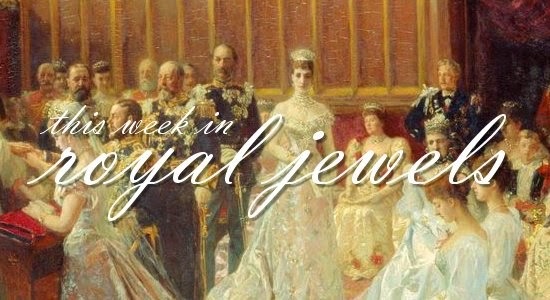 For more on the Order of the Bath, check out my recent "Royalty by Numbers" post at The Royal Roundup. 4. After failing to sell during its first trip to the auction block, the garnet, diamond, and pearl kokoshnik tiara that belonged to the Rosenborgs (a junior noble branch of the Danish royal family) sold at Sotheby's on Tuesday for just over $275,000. Here's a link to my post on the rest of the royal jewels that were included in the auction. 3. A descendent of German royalty married the son of a British baron this weekend. Florence von Preussen wed the Hon. James Tollemache in Somerset. Marlene Eilers Koenig reports that the bride wore a tiara that belonged to her grandmother, Lady Brigid Guinness. Photos of the wedding (and especially of one guest in particular) are available here. 2. The Norwegian royals hosted the president of Israel this week, and the state banquet gave Crown Princess Mette-Marit and Princess Astrid opportunities to don tiaras. Mette-Marit wore her wedding tiara, while Astrid wore her fabulously loony aigrette (which ranked high on our recent list of the top ten maddest tiaras!). Queen Sonja didn't attend, reportedly because of a conflicting trip. 1. On Wednesday, the Dutch king and queen hosted the diplomatic corps for a gala dinner at the palace in Amsterdam. For the event, Queen Maxima brought out major jewels: the ruby parure made by Mellerio for Queen Emma in 1889.